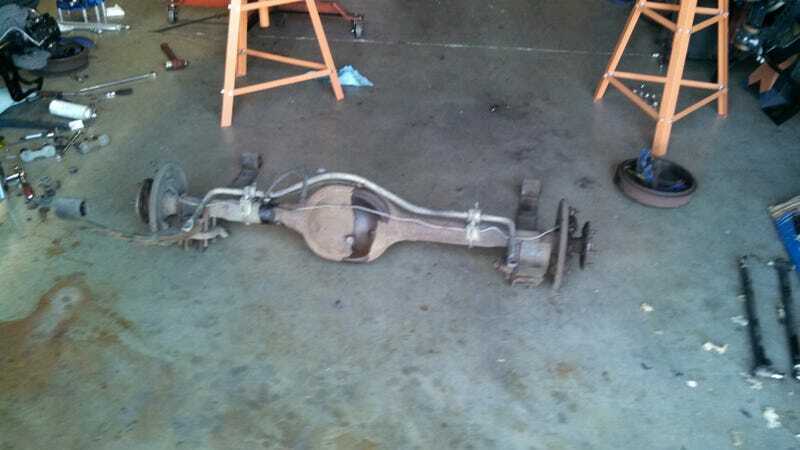 Rear suspension is out! Came out about as long as I expected, though for different reasons than actually happened. The 8" is actually pretty light, which I found surprising. Anywho, got that out, assembled my coilovers which are Koni yellows valved for track duty with 255 lb-in springs. The spring seat sleeve has a very tight fit, and the shock body had doubled-up stickers, so that made things interesting. Ended up taking the sleeves off to remove the excess stickerage. Sorry, forgot to take pics of those. Put my front pads in, as well. Sooooo much easier than the rears. Just remove the cover, walk the pads out, push the pistons in, and slide the new pads in with the cover going right back on. I gotta find some calipers that are this easy for the rear. Put dowel pins in the axle center section. These will be used for transferring the torque loads to the torque arm, since Griggs doesn't trust the cover bolts, which are only designed to keep a seal. However, I'm not very good at holding a drill dead straight while boring through about 1/2" of metal, so JB Weld came in handy.